Laurence Ross writes about Anastasia Pelias’ abstract depictions of the female musicians who have influenced her. 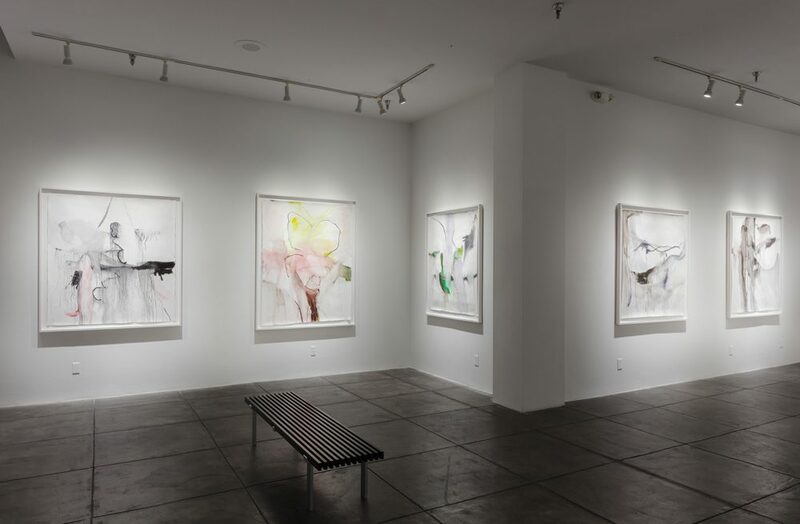 Installation view of Anastasia Pelias’ “Sisters” at Jonathan Ferrara Gallery, New Orleans. Courtesy the artist and Jonathan Ferrara Gallery, New Orleans. 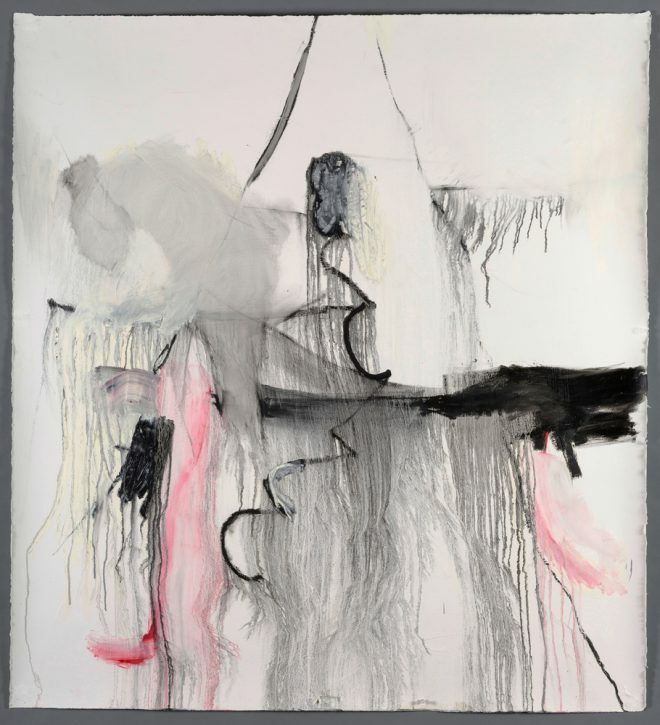 In “Sisters,” an exhibition of new work at Jonathan Ferrara Gallery, Anastasia Pelias draws inspiration from a wide range of female vocalists who have become the subjects for her abstract paintings. The artist refers to each painting as a “portrait,” though we do not need that framework to appreciate her alternatingly forceful and elegant play with line, color, texture, and layering. However, the title of the show seems appropriate, as all of these women, seen through Pelias’ lens of abstract oil-stick paintings, bear a family resemblance—whereas a photography exhibition of the same women would show their many apparent differences. Though there are occasional shapes of brighter color—pink, yellow, green, blue—the primary palette employed throughout the show consists of greys, blacks, browns, and other soft hues watered down from their original vibrancy. With thin lines streaking down deeply textured paper, many of the pieces have a rain-streaked or wind-blown quality, making the shapes and colors that survive take on the durable quality of driftwood: These portraits of women, many of whom are perceived or remembered by popular culture for their powerful presence in addition to their voices (Nina Simone, Stevie Nicks, Amy Winehouse) suggest a storm has been weathered, though weathered with some element of grace. Anastasia Pelias, Stevie, 2016. Oil stick on Arches paper. Courtesy the artist and Jonathan Ferrara Gallery, New Orleans. Several pieces feature vertical lines, arcs, or curves of color that stretch out like limbs ready to embrace the viewer. While the portraits are hardly humanoid, the human element is palpable through the evidence of Pelias’ hand. The expression and articulation seems, if not carefully pre-meditated, quite intentional. These paintings are a far cry from random. They possess an element of spontaneity, yes—but so does much of the most enchanting music. Karen, 2016, is covered nearly corner to corner with mostly muted color spread thinly, providing minimal negative space and creating a veil of melancholic claustrophobia. At five foot nine inches, the portrait is taller than Karen Carpenter was herself. She could have been easily swallowed within its space. Is this interpretation—taking personal knowledge of a singer’s life and applying it to line and color—reading too much into the work? Possibly. Though a portrait with no discernible figure begs the attentive viewer to attempt to follow the mind of the painter on the paper, just as one would with an essay or song lyrics. The titles of each piece—the first name of the subject scratched in pencil on the gallery wall—capture the attention of the viewer; however, Pelias’ voice is the one that most clearly resounds. The space, with some works towering over six feet tall, echoes the feel of Italianate corridors lined with the life-sized statues of Grecian or Roman gods. Of course, the subjects at hand are firmly rooted in the recent past, if not our immediate present. These rock stars have become our modern day mythology. Diana Ross stands in for Diana of the Hunt. Oil stick and Arches paper stand in for a chisel and Carrara marble. Figures are washed away into what feel like essences. But the relationship between muse and artist, spectacle and spectator remains. Janus, with two faces, looks toward both the past and the future; Pelias’ portrait of Janis shows a side of Joplin the viewer could not anticipate. Discovering a tail-side essence of these musical artists is perhaps the show’s greatest pleasure. Anastasia Pelias’ “Sisters” is on view through January 28, 2017, at Jonathan Ferrara Gallery (400A Julia Street) in New Orleans.